ANSWERS TO YOUR QUESTIONS about THE store, OPERATIONS, involvement, and more. To finance the store, we need to show lenders that there is a base of customers who will shop at the co-op after it opens. One of the best ways to do that is to register 1,000 paying co-op member/owners. The sooner you join and help us reach that number, the sooner the store can be built and will open. This is a Co-op. That means as a shareholder you have a direct ownership in the organization. You own it. You own a piece of a democratically run, community based company and as such, you can have a say in how it's run just by getting involved. We use Member and Owner interchangeably, but remember, they mean the same thing. You own it. It's your store. How big will the store be? Our feasibility study, completed in April 2012, provided data that will let our consultants advise us about how big a store the area’s consumers are likely to sustain. Best estimates are that the store will open with about 3,000 or 4,000 square feet and could ultimately grow to be about 6,000 square feet. In contrast, the Putney Co-op has a 3,000-square-foot store; Lisai’s Market in Bellows Falls is about 9,000 square feet; and Shaw’s Supermarket in Walpole is about 23,000 square feet. The co-op in Littleton, New Hampshire, opened in 2009 with 15,000 square feet and already plans to add 5,000 more. Can I shop at the co-op even if I’m not a member/owner? Definitely. Everyone is welcome to shop at the Great River Co-op. However, your membership will help the co-op open sooner and stronger. If I’m a member/owner, do I have to work at the co-op once in a while? No. The co-op will have a paid staff. Member/Owners will not be obligated to work at the co-op. Do members have to serve on committees and attend meetings? Only if you want to but remember, it's your store. Volunteers always are needed to help with events and are welcome to be part of groups and committees that will guide the future of the market. As a voting owner, you can run for a seat on the board of directors. Will members get a discount when they shop at the co-op? While we do anticipate member specials periodically, there will be no regular member discount. Instead of discounts, member-owners will share in the co-op’s profits when the board of directors declares a distribution. When members shop at the co-op, their membership number and amount of purchase will be recorded electronically. If a patronage distribution is declared at the end of a year, profits will be allocated to members in proportion to the amount of money each member has spent at the co-op during that year. Don’t co-ops sell just organic and health foods? No. The Great River Co-op will stock the foods that members ask it to. However, unlike chain supermarkets, Great River will emphasize locally raised meats and produce and will make it easier for shoppers to make healthy food choices in place of unhealthy ones. While co-ops do generally stock organic and some “specialty” foods that would be hard to get elsewhere, each co-op is tailored to serve its local community and the needs and preferences of its customers. Rather than being all-organic and, therefore, possibly higher in price, many co-ops have adopted a hybrid product mix. They carry organic and local goods, but also will stock mainstream products that their customers need and want. Great River’s primary focus will be on local food and products, organic or not, and also will stock a range of supermarket staples that the community asks the store to carry, even if it takes the co-op a while to grow big enough to reach that goal. I’ll join when the store opens. That's like saying "I'll invest in my business after it's up and running." You can do that. But if you wait, you run the risk that the co-op won’t open at all. The reason is that we need to convince lenders that there are enough committed people in our region who will shop at the co-op after it opens. To do that, we need to register 1,000 owner-members. The sooner you join, the sooner the co-op will open. The longer you delay, the longer it will take the co-op to open. Why should I give money to a for-profit business? If you're joining, you’re not making a charitable donation. You’re buying an ownership share, just like buying a share of stock in a company, only you are a lot closer to this company than what's traded on Wall St. Owners share in the co-op’s profits when the board of directors declares a distribution, just like a shareholder in a corporation does but here you have the opportunity to really be involved in a community owned company and to invest in something that has a direct impact on where you live. I don’t want a store to be built on the cornfield on Route 12. I want that land to remain in agricultural production. The co-op will not be built on a cornfield on Route 12. The co-op has abandoned plans to locate there some time ago. The co-op will be located between The Scoop Shop and Pinnacle View. Doesn’t Avanru Development control the co-op? The Walpole residents who own Avanru Development helped organize the co-op but have left the board of directors and now have no involvement with the co-op. None of Avanru’s owners are on the co-op’s board. Avanru’s owners are all members of the co-op as individuals, just as more than 530 other individuals and families in our area are. Avanru has no management role, controlling interest, or business arrangements with the co-op. The co-op is separate from, and independent of, Avanru Development and the condos or apartments and other retail store space that Avanru is planning in Walpole. Won't the co-op be too expensive for most of us to shop there? The co-op will not be able to under-sell a chain supermarket regularly or on every item. Prices for many items at the co-op will be above those that a national chain can offer. However, Great River – as most co-ops do – will continuously seek out and offer special buys to customers wherever possible, often competing with prices at nearby supermarkets on a range of items. Also, Great River will eventually belong to the National Cooperative Grocers Association. This group of over 200 co-op food stores has enormous collective buying power, keeping prices as low as possible. The co-op’s buyers will work with local farmers and food producers to establish a pricing structure for their products that is fair to both them and to co-op shoppers. In addition, co-ops' buyers are always scouting for bargains that can be passed on to their customers and often find items that can be price-competitive with chain supermarkets. When thinking about prices at a co-op, it’s important to remember that a co-op’s prices bring other kinds of value. For example, a co-op’s profits stay in its local community instead of being sent away to a chain store’s regional and national headquarters. Studies by the Business Alliance for Living Local Economies and others show that as much as 87% of a chain store’s revenues leave the area in which a store is located; but that about 50% of a locally owned business’s revenues stay in the community – financing the creation and expansion of local businesses, creating jobs, expanding consumer choices, building homes, improving the tax base, and creating other kinds of value. Shopping at a co-op is, very literally, investing in the economic health of your community. Won't the co-op compete with farmstands and drive them out of business? In Hanover and other areas where co-ops operate, the number of growers, farmers markets, and farmstands has actually increased. The presence of a co-op tends to encourage not only new growers and the expansion of existing farms, but also educates and inspires consumers to increase their purchases of a variety of local foods. The Great River Co-op can become an engine that supports and encourages business development for local farmers. What if the co-op isn’t able to get 1,000 members? The board of directors believes that, without 1,000 owner-members, it will be more difficult for the co-op to attract financing and, therefore, be more difficult to open the co-op’s market. The co-op's board will use the results of the market and feasibility study to demonstrate that a market exists for the Great River Co-op and will consult with potential lenders and other experts to decide whether to pursue the project and continue to seek the necessary additional members. Co-ops are usually community-driven, grassroots projects. This one was started as a way to fill a development project. Actually, the idea of a co-op has been discussed in our region for more than 20 years. Several years ago, a group in Bellows Falls tried to organize a co-op but didn’t continue. One of the largest obstacles to the advancement of a co-op has been the lack of a suitable site. When Avanru Development offered a site specifically for a co-op, the movement had no trouble attracting more than 200 members within two months. So, although the original development project served as a catalyst to revive this movement, the Great River Co-op is community-driven in the way that most other co-ops are. How is a co-op different from a supermarket? Co-ops are owned by people who live in the community in which they’re located. The co-op’s management is governed by a board of directors that the local owner-members elect, not a faraway group of executives who never visit our area. This gives co-op members and customers much more direct control of the co-op. Also, the co-op’s money is kept in local banks and the co-op’s profits stay in our area instead of being sent off to pay for regional and national levels of management. Co-ops also tend to have an approach of “working with” consumers instead of “selling to” consumers. For example, co-ops typically conduct ongoing food and nutrition education programs for their customers and in local schools. The Great River Co-op hopes to include a greenhouse area where school classes can start seeds in the late winter, watch them sprout, and then transplant them in the spring. In addition, many co-ops work directly with local farmers and food producers to encourage – and, in some cases, financially support – tests of new crops, new food products, and expanded production. Supermarket chains rarely become so deeply involved in consumer education or in the agricultural economy of a local area. Is a co-op different from a buying club? Yes. Co-ops are community markets created and run by local community members. 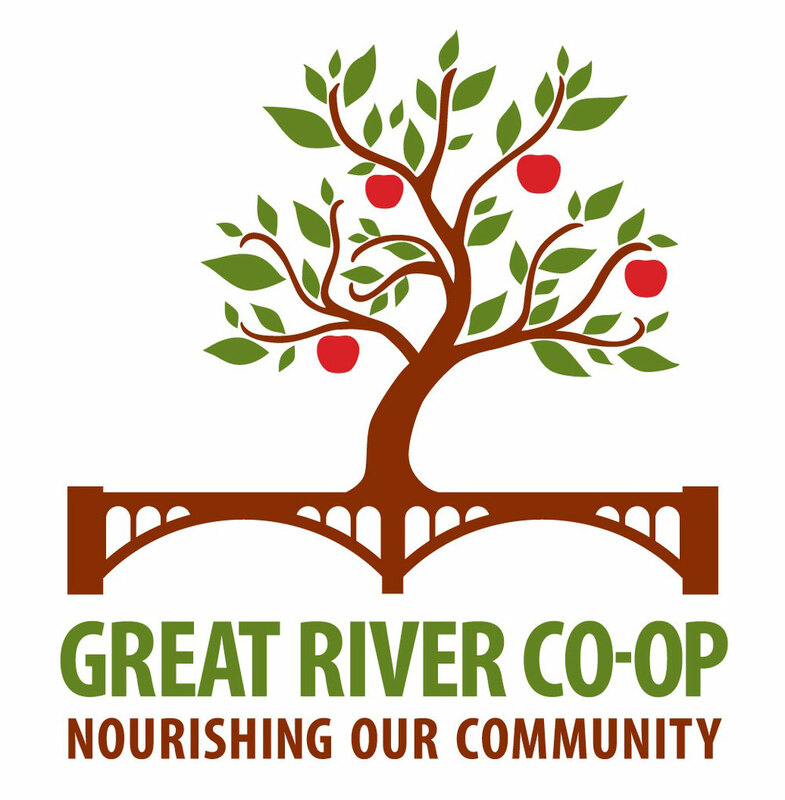 Members of the Great River Co-op pay a one-time $25 fee to become a member. There are no annual fees or dues as there are in most buying clubs. Even better, co-ops may offer annual rebates based on your patronage and a range of additional benefits. Send us an email and we'll do our best to give you some good answers.